Of all the things I could do, what is most important? Of all the things I could do, what really has to get done this week? What do I want to get done this week? I get help from my personal agility coach who asks me these questions at regular intervals, so that I don't forget to do it. 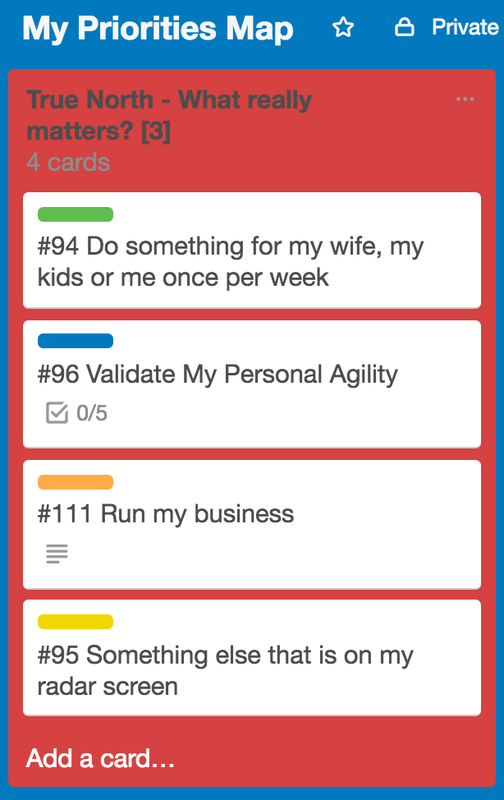 I also get some help from two information radiators: My priorities map (which I maintain on Trello) and my calendar. My priorities map helps me remember what's important and what I want to be doing. Sometimes I use my calendar for additional help on focusing during the day. Getting my life under control meant saying 'No' to unimportant stuff so I could say yes to things that matter. Sometimes it even meant saying 'Yes' to unplanned resting, because I am not a machine, and sometimes I need to rest. How does this work? Here is an example from my life: my kids had kind of gotten used to the fact that their requests never really got processed. I was working so hard on "important stuff" that I never had time for family stuff. Once I decided doing things for my family really mattered, so I put it on my priorities map as point number one and labeled it with a green dot. Then every week, as I plan my week, I make sure there are a couple of green items in the list of things I want to accomplish this week. The difference was obvious immediately! Now I apply that principle at home and at work. What really matters? These 3, maybe 4 priorities in my life guide what I say yes to. Each priority has a color code for easy identification. Of all the things I could do, what is most important? I always have too much to do, so I want to focus on things that matter. If I am considering doing something that doesn't match up to something that matters, I ask myself why and whether I should do it! Of all the things I could do, what really has to get done this week? Some things have a pressing deadline and it's important not to lose sight of them. What do I want to get done this week? I don't have time or energy to do everything. So of the important things and the urgent things, which ones do I think I can accomplish this week? Unchecked, the urgent tends to push out the merely important, so I sometimes I need to make space for the important. Sometimes that means that urgent stuff gets postponed or even cancelled. What am I going to do today? This keeps me from going off on a tangent. Sometimes it's even helpful to plan my time in my calendar, for example to make room for a larger chunk of important work. Who can help me? At the very least, I needed someone to ask me these questions once a week or so, so I remember to answer them! Most approaches to managing your time assume that you are really by yourself. In reality, you can ask a partner, your spouse, an advisor or a professional coach to ask you the questions once a week or so. You can ask other people for help. Individual performance is important, but collaboration enables so much more! By reflecting occasionally on what you are doing and why, you ensure that you're not just working hard, you're also doing the right thing! Call for help: I'd like to find out if this approach could be useful in your context. If this has piqued your interest, and regardless of whether you think the answer might be yes or is probably no, I'd like to talk to you! Please contact me, and I'll set up an appointment! Thanks! UPDATE: I have updated and will continue to update this article to make it clear. First change. The questions changed my life, the information radiators just help me do what I want! Last Update: 12-Sep-2016 at 09:12.